My Halal Kitchen Has a New Address! An important note to all My Halal Kitchen readers: this site has been officially moved to a new domain, http://www.myhalalkitchen.com. Please visit there to see what’s cooking in, well…my halal kitchen! I’ve been off for a while, but insha’allah soon there will be more great ideas for recipes and kitchen projects I have in mind. Also, if you read the Everyday Halal Living blog, that site has also been officially moved to a new domain, http://www.everydayhalalliving.com. Thanks for all your visits, comments and feedback. Please, keep them coming!! This site has been officially moved to a new domain, http://www.myhalalkitchen.com. Please visit there to see what’s cooking! If you’re anything like me, you buy a whole bag of apples with the intention of providing healthy snacks for yourself and your family all week long. The problem in my case is that I try to convince myself that two people in a household can finish them before they lose their crunch. And sometimes husbands request an apple dessert, not just an apple. How quickly the suggestions for applie pie and apple tart came forth from mine. He even offered to buy the crust. I wasn’t in the mood for tarts and pies and I surely didn’t want a store-bought crust (unless it was the Trader Joe’s brand, which is the closest to homemade I’ve ever had). In fact, I was just too tired to bake. I decided to come up with this quick fruit compote that would be a versatile dish, not just for dessert, but also a snack with yogurt or a topping on tomorrow’s breakfast oatmeal. I hope you’ll enjoy it using your own local, freshest combination of fruits. 2. Butter the bottom of a large, oval or round Pyrex baking dish. 3. Place apples and blueberries in dish. Sprinkle with sugar and let sit for 3-5 minutes. 4. Add lemon juice. Cut butter into small pieces and put in different places around and under fruit. 5. Bake for approximately 1/2 hour or until apple skins have browned well. 6. Remove from oven and use a spoon to turn fruit to mix. With the back of spoon, mash up the apple pieces and combine with blueberries, but don’t over mix (unless you want applesauce!). Remove apple skins if you desire. Serve warm as-is or on top of ice cream. You can also add to oatmeal or farina at breakfast. Or, top the compote with creme fraiche, whipped cream or real heavy cream for a delicious and elegant dessert. Last October I visited the Queen Creek Olive Mill just outside of Scottsdale, Arizona. I never knew this region could cultivate olives until I heard about the mill from a relative who lives nearby. After doing a bit of research on the place, I just had to see it before heading back to the Midwest. We sure can’t grow olives in Chicago! I’ve always been interested to know how any type of Mediterranean food grows. I suppose I feel the need to learn so that one day I might be able to grow any number of them myself: olives, pomegranetes, lemons, dates, apricots, almonds. I’d probably need an orchard first, though. Right? I really feel bad that for the number of times I’ve visited Sicily, I’ve never really gone to the olive groves to learn more about from where some of the best olive oil in the world really comes. I enjoyed eating- a lot– in Sicily, yet never really bothered to venture further than the wonderful jovedi (large Thursday market) where I could delight in the colorful produce and fresh, exotic Mediterranean seafood. There, things like olives and cheeses were very expensive, yet tempting enough to buy just a handful and be comforted to know that this land of olives would forever supply us with them. Needless to say, upon hearing about the Queen Creek Olive Mill, I was instantly interested in going there to see first-hand just how and when olives are hand picked and perfectly pressed to make the purest olive oil one can find in the U.S. Who would have known that in this little Arizona town one could grow olives when conventional thinking would lead you to believe that California is the only American place cultivating these precious trees? Upon arrival, we decided to take the $5 tour of the mill where we would learn all about the process of olive cultivation, picking and pressing. We were first escorted out onto the terrace where a young employee of the company explained to us the very basics of how the Queen Creek Olive Mill was started and about the unique temperature here that makes it possible for these olives trees to flourish. The business of producing olive oil for sale started just over five years ago here at the base of the San Tan Mountains, an area known for its fertile soil. In this micro-climate, the olive trees will amazingly not experience any mold or fermentation. Harvesting goes from mid-October to mid-December, so our visit was just two weeks shy of the olive picking season. During the season, olives are harvested at this pesticide-free grove daily by raking and combing them off the trees. Fallen olives are never used because they are considered to be either over-ripe or invaded by pests. Each olive tree will give anywhere between 50-200 lbs. of olives. One ton of olives will go on to produce 55 gallons of the extra virgin olive oil. Queen Creek’s trees include a variety of Italian, Spanish and Greek ones such as the Mission, Manzanillo, Sevillano, Pendolino, Grappolo, Lucca, Frantoio and the Kalamata. During the harvesting season Queen Creek bottles their olive oil every three weeks and blends their oils every three to five weeks. Their base oil produced from these trees is made of a Tuscan style blend, from which they make some very interesting flavored and cold pressed oils (Meyer Lemon and Blood Orange were two of my favorites), all of which you can taste yourself before purchasing at the store. Back in the mill we learned more about the technicalities of the oil extraction process and the machines that make that happen. For example, the motors on the machines are all from Italy and preventative maintenance is done on them before and after the harvesting season. The owner even goes to Italy every summer to continue educating himself about olive cultivation and the oil-making process. Before you can dip your tasty bread into a dish of golden olive oil, these tiny fruits must go through quite an ordeal for you. A defoliator will remove the stems and leaves and the olives will then get a two-stage bath. Afterwords, they must be put through the three main parts of the mill: 1) the mill itself, which pulverizes the meat, pit and seed into a paste; 2) the malixer, which without it there would be no oil; and 3) the centrifuge, where as the paste enters all the solids and water in the olives is extracted. *Every oil has a regional flavor. For example, Tuscan oil is spicy; Spanish oil is fruity; and Greek oil is heavy. So you may be wondering when I’ll get to the brownies- and what in the world is a blood orange? Well, you’ll be relieved to know there isn’t any blood in a blood orange, it simply refers to the noticeable red color that runs through this citrus fruit. As far as where the blood orange comes into play in the brownie recipe, I was really surprised and impressed to see that someone came up with the idea of mixing chocolate with this unique citrus fruit in the form of a flavored oil. I’ve known about blood oranges since I was a child because of my Sicilian heritage, as this is a popular fruit on the Mediterranean island, but it is virtually unknown in the typical American diet. I actually found the recipe at the Queen Creek Olive Mill store where they give away for free many recipes utilizing their olive oil products. In this particular recipe, you will not need to buy any blood oranges becauase the oil is already so aromatically flavored. Below are the ingredients and the instructions for the Blood Orange Olive Oil Brownies. Please see the resource list at the end of this post to find the special ingredients in this recipe. You can also find the recipe online at http://queencreekolivemill.com/borangebrownies.jsp. I have, however, made a few changes to the recipe by adding my personal suggestions for ingredients and instructions based on my experience making them. Feel free to take a look at this one and the original to see which works best for you. Buon Appetito! 1. Preheat your oven to 350 degrees and then measure all ingredients before beginning. 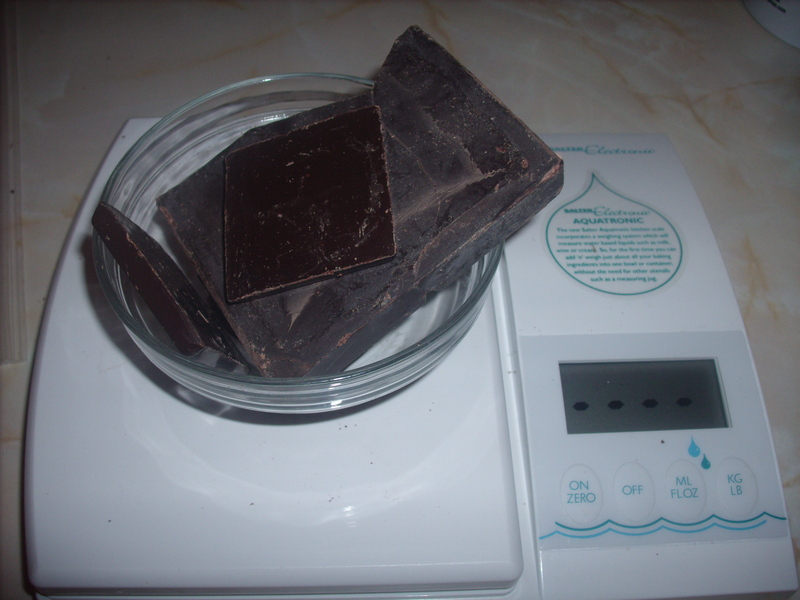 It’s best if you have a digital food scale to measure accurately, especially for the chocolate. In baking, accuracy is a must! 2. Spray or grease a 9 x 12 baking pan and line the bottom with parchment paper (can be found at such stores as Wal-Mart, restaurant supply stores or gourmet food shops). This helps prevent the batter from sticking when done. 3. In a small saucepan, melt all of the chocolate over low heat. Stir constantly. When completely melted, set aside to cool. 4. In a separate bowl, sift flour, baking powder and salt. Add the sugar to this mixture. 5. Melt butter. In a large mixing bowl, pour the melted butter, then add the Blood Orange Olive Oil or your oil substitute. Add one egg at a time to this mix, incorporating each one fully. 6. Add the vanilla (extract or bean) to the cooled chocolate mixture and combine well. Add this mixture to the butter and olive oil mixture in step 5. Then, fold all of the dry ingredients plus the walnuts into your large mixing bowl with all of the previously mixed ingredients. Combine everything well, but don’t over mix the batter. 7. Pour the entire mix into baking pan and bake for 25-30 minutes or until brownies pull away from the side of the pan. I made the mistake of not preparing this breakfast the night before. If I had, I am guessing this morning instead of taking 40 minutes to set the table and serve the food, it might have taken me not more than 10 minutes to do. This breakfast is so healthy and so simple to make, not to mention inexpensive. Instead of sugary and expensive cereals, breakfast bars and muffins, I opted for more protein and healthy dairy, fruit and herbal tea this morning. Hard Boiled Eggs: Thinly sliced, these were great with the bread and cheeses. Artisanal Wheat Bread: If you don’t have time to bake your own, buy from a grocery store, bakery or farmer’s market. Be sure to buy only whole grain bread for optimal health benefits. Plain Yogurt: Goes great on your bread and with the eggs. You could also mix some fruit in it to reduce some of the sour taste of plain yogurt. Fruit Plate: Today I arranged dates, oranges and sliced bananas because that’s what I had on hand. Serve whatever is fresh and seasonal. What are your ideas for a quick, healthy and inexpensive breakfast? I just love fish. But, fish is a precarious food. It has to be fresh or not served at all, in my opinion. Although I’m not a fan of any canned food, I have to say that canned tuna and salmon really do save the day-and save you the guilt of feeling like you’re eating unhealthy. They should be canned when fresh, preserving that freshness, and when canned in olive oil you can get even more health benefits otherwise just purchase tuna or salmon in water. The recipe below is not for your typical tuna fish sandwich; it’s for a Mediterranean style fish pattie whose preparation method is so similar to the way us Sicilians flatten, dip in egg, bread and pan-fry everything from eggplant and zucchini to chicken, veal, lean beef and fish. The only difference with this dish is that you really only need one mixing bowl to mix up all the ingredients that you would normally include in separate steps for the others I mentioned. The best thing about this recipe is that it is so quick to make. I had a few friends over for lunch recently and actually asked one of them to make the patties so she could learn hands-on how it was done- and how quick and easy preparation was. I served the lunch patties with an accompanying soup, salad, a cheese plate, roasted vegetables and pita bread. At dinner, I made them again for my husband’s dinner by making them an accompaniment to his chicken & rice soup and a hefty ciabatta bread bun. Yumm! Below is a recipe for four people (8 patties) and some photos to show you the frying and the end results. Just imagine the different types of your favorite bread you could serve it on. Mix all ingredients well, except olive oil in a bowl. Form flat, round patties, adding more bread crumbs if necessary to keep their shape. Do not add more eggs, as this will make the patties too difficult to form. Heat the olive oil on medium-high in a shallow frying pan until hot, but not burning. Fry patties for about 6 minutes on each side, depending on the size of your flame, if using gas stovetop. Lay on a plate with paper towels to drain excess oil. Serve up as a sandwich, as a side dish or on top of a salad. Any way you choose will be delicious! If you’re like many other Americans today, you’ve been keeping a close eye on all of today’s historic Presidential Inauguration events. For foodies like myself, what was being served up at this afteroon’s luncheon was of key interest to me. This made me wonder if there would be organic food on the menu. What about Mexican food? I was interested to know but never imagined that the menu, let alone the recipes, would be available online! Second Course: Duck Breast with Cherry Chutney , Herb Roasted Pheasant with Wild Rice Stuffing, Molasses Whipped Sweet Potatoes and Winter Vegetables. -For the Duck Breast with Cherry Chutney recipe, substitute kosher grape juice for the red wine and do not use the Dijon mustard called for in the recipe, as most Dijon mustards have red wine vinegar in them. I would not substitute with any other kind of mustard, as they are mostly too ‘yellow’ and may discolor the end result. Just leave it out. And, If you’ve been a reader of this blog before, you know where you can find a halal duck, (http://www.midamar.com), or scroll down to find the article “To Roast a Duckling” where you can read more about halal ducklings. -For the Herb Roasted Pheasant with Wild Rice Stuffing, if you can’t find a halal pheasant, try roasting a halal quail instead. They can be found, usually frozen and sold in packets of two, in most Middle Eastern or Mediterranean marts. Online they can be found at http://seattlediscountwarehouse.com/Quail%20page.htm, however, I have never bought from this merchant and cannot comment on their quality, taste or halal certification. -The dessert calls for vanilla extract. Do not use the pure vanilla extract because it is stripped with alcohol, usually vodka, to bring out the extract of the vanilla bean. Instead, try using your own vanilla bean or an imitation vanilla extract- those usually don’t contain any alcohol at all. Here’s the link to the pages where you can download the menu and the recipes listed above. I wouldn’t normally make this type of recipe out of the blue or just for having both grapefruit and shrimp somewhere in the kitchen. I made this recipe because a fellow website editor was asking for recipe writers, cooks and cookbook authors to come up with a recipe where ‘grapefruit is the main feature’. This is my own version of a recipe for Grapefruit Shrimp Curry I saw in an old cookbook from Florida that’s been on my shelf for years. If you would like the information for the original recipe and cookbook, please see the information at the end of this post. I made this recently, and I can tell you, it is wonderful! It tasted like a restaurant-made dish from a Thai restaurant. It was very filling, but not too heavy. I served it on a bed of rice. You might also want to add a small bowl of fishy or vegetable soup afterwards. *Note: Prepare all ingredients ahead of time and organize them well. Once you begin this recipe, the steps go fast and you will not have time to leave the stove lest you burn the butter, dry out the roux or curdle the sauce. 1. In a small saucepan, melt the butter on low with the garlic and saffron, approx. 5 min. Do not burn. There is no need to stir. 2. Once the butter mixture is done, pour into a separate large sauté pan. Add onions. Over medium-high heat, sauté the onions but do not brown them, approx. 5-7 minutes. 3. With a wooden spoon, blend in the flour to make a rough paste, or roux. Add the salt and curry powder and blend. Keep blending to avoid burning the roux, until all ingredients are well mixed. 4. Turn heat to medium-low. Add coconut milk and blend until the roux is completely free of any lumps. Add grapefruit juice and keep stirring to smooth out the mixture and avoid curdling of the coconut milk. Cook until thick, approx. 3-5 minutes. 5. Add shrimp and stir, until you see that some have begun to turn pink. Next, add the grapefruit sections and continue stirring the mixture to avoid anything from sticking to the bottom of the pan. Turn heat to low, if necessary. Be sure that shrimp is cooking well by turning pink and becoming a bit smaller than when raw. This may be a bit difficult to see through the pinkish color of the sauce, but keep turning the shrimp in the pan to look for this color. Cook in this manner for approximately 10 minutes. 6. Serve on a bed of white sticky or jasmine rice and top with roughly-chopped cilantro. Serves 4-6, depending on the appetites! 1. Saute onions in butter. Do not brown. 2. Blend in flour to make a roux. Add seasonings and bouillon cube. Blend. 3. Add liquids. At this point, you must stir constantly to avoid curdling. Cook until thick. 4. Add shrimp adn grapefruit sections and heat through over low heat. Serve on a bed of rice. Duck Fat in a Roasted Red Pepper and Cheese Sandwich? Ok, I know this isn’t the most exciting notion of a sandwich, but scroll down and see the pics of this creation and you’ll at least wonder if it tastes as good as it looks. Ok, give me credit- I creatively reused -instead of wasted-that plethora of duck fat that came from my duckling last week (scroll down to read my post, To Roast a Duckling). Well, I don’t deserve a whole lot of credit. It really wasn’t my notion of ‘reusing’ that spurred me into this frenzy of finding dishes I could cook using it; it was more of my gourmet-obsessed mind to create dishes that look like they’ve come straight out of a (fancy) restaurant. I read about how all the best chefs in the world tout the incredible flavor that drips from this bird. I want to be like them, in my own kitchen (and without all the stress). Besides, did I forget to mention that Julia Child told me (not directly, of course) to use this fat, too? You might be thinking that this fat isn’t very healthy, comparing its thick texture when cold to hydrogenated oils, hardened vegetable oils used to line your baking pan, or even lard, but duck fat doesn’t fall anywhere near those oils in comparison. In categories of taste, versatility and healthiness, it beats out all of them. I also really love a book called Real Food by author Nina Planck. The information she provides in her book really helped me to release my fear of eating butter, cheese, whole milk and animal fats (halal only, of course). In fact, she provides solid and clear arguments about why you shouldn’t choose otherwise. Foods that are processed, chemically altered, genetically modified, unnaturally preserved, and even some that are pasteurized really come into question in her book. I suggest anyone interested in getting healthy or responsible for feeding and raising young children should read this book cover to cover. Ok, so I got off topic for a minute- but found a great opportunity to share one of my favorite authors with you…. Back to the roasted peppers. I had an enormous bag of ‘Mysteriously Sweet Red Peppers’ from Mexico- yes, that was on the label- that I had to do something with. They were nice enough to stay firm in my refrigerator’s crisper until I could figure out what I wanted to do with them for a week or two. I decided on roasted vegetables- an easy dish because all you have to do is spend a few minutes to loosely chop your items, throw on some salt, a bit of sugar, any seasoning you like and add some fat. Put them in an oven-safe dish and throw them in the oven at 350-375 degrees and wait for your nose to tell you they’re done, not burnt. Mine took about 40-45 minutes to get really nice and brown. In this particular dish, I added red onions and whole, peeled garlic cloves to add flavor. I used about 4 TB. 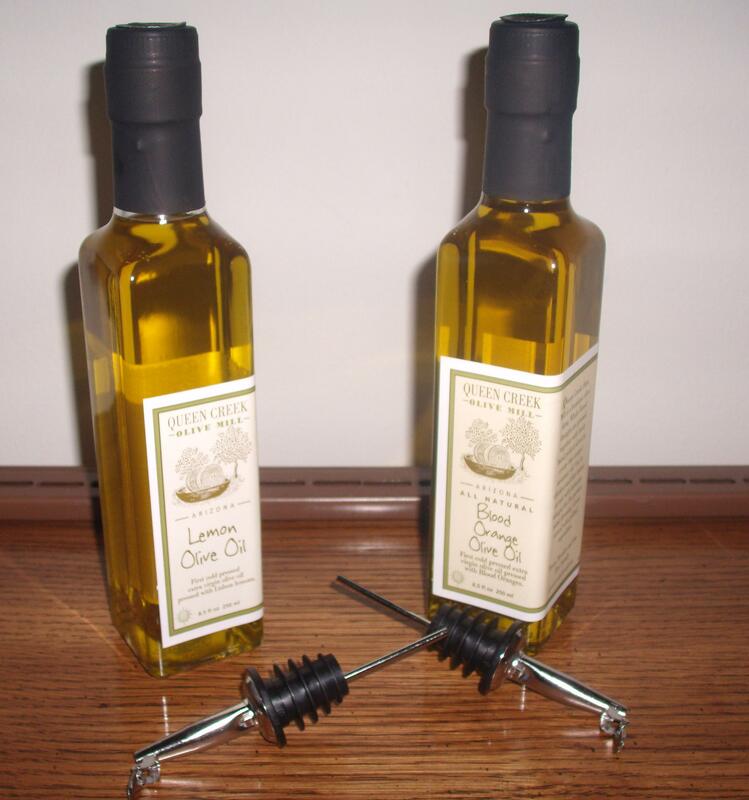 of the cold duck fat, but a great alternative is extra virgin olive oil. You could add eggplant or zucchini- any type of vegetable with a similar cooking time. Carrots or potatotes would need longer to cook unless they are blanched, so don’t use them unless they are. When your dish is done, serve with French, Italian or pita bread and dip your peppers into them. You could also serve as a side dish to chicken, or top a pasta dish that needs a bit of jazzing up. One thing I must say is that this dish is even better the second day when the flavors have married. That’s where this sandwich comes in. I didn’t want to eat it in the same way the next day, so I got out a sandwich bun and toasted it. Meanwhile, I warmed up my roasted peppers in the microwave with a slice of Tillamook swiss cheese on top. When everything was ready, I ate it with pure delight, realizing I couldn’t have gone out and had a better sandwich elsewhere. It’s not only the gratification of making your own food, without difficulty or waste, but the gratification of knowing that home really is the best place in the world to eat, making a mini meal like this worth the effort. So, are you convinced yet? Make this sandwich yourself- or just the peppers as an appetizer with bread- and you’ll become a sort of taste believer. And, umm, you don’t really have to use duck fat- unless of course you roast a duckling, too. Does this ever happen to you? You’ve planned a gourmet dinner for the evening (ok, semi-gourmet) and, just when you think you’ve got enough time and everything is under control, something seriously breaks your pace- a stove that needs to be calibrated, a husband coming home earlier than anticipated, meat that isn’t completely defrosted, or a recipe you’ve just read to the end and realized you need two hours to cook instead of one? Well, most people would only be afflicted with one of these problems per dinner drama, but last night, I had all of them to deal with. My Navarin Pantier (Lamb Stew with Spring Vegetables) was my recipe project of the day, another of Julia Child’s delights I was trying to master. (No wonder the cookbook it comes from is called Mastering the Art of French Cooking). I had no ‘Plan B’, knew my husband was famished, and I had very few exciting ingredients in the house to play with. Taking one look around my fridge and counter, I had to think quick about what I could do with apples, cheese, spinach, onions, tomato paste, odd pieces of cheese, and various experimental jars of homemade creme fraiche. It was like playing ‘Iron Chef’ against myself. Ok, it has to be soup and salad tonight. Soups without pasta, rice, potatoes or meat are usually not hearty enough to fill a hungry stomach, but I knew if I made a simple soup with creme fraiche added, we could eat it with hearty bread and a salad, which would be perfect for the late dinner we would have. I decided on a Creamed Spinach Soup made by sauteeing onions in butter and olive oil and adding tomato paste and water to fill half the pan. I let it cook till it came to a boil. I then added spinach and let it simmer for about 10 minutes, just enough time for me to cut the cheese and peel and slice the green apple for my salad. I left the slices to soak in cold water until I was done so they wouldn’t brown. I returned to my soup and tickled it with my handy immersion blender- a tool every soup maker should have, in my opinion. I blended a little at at a time, until the entire pan was a creamier version of the original. I let it simmer for a minute or two, then added 2 heaping tablespoons of my homemade creme fraiche, stirring it in until all of the whiteness of the creme disappeared. Two minutes later, I was satisfied that it was finally a creamed spinach soup. Returning to my salad, I rinsed and drained the baby greens then gave them a whirl in my other kitchen favorite- my salad spinner. I dried the greens with a paper towel and laid them gently in a bowl, added rough cubes of white cheddar and slices of the green apples I’d cut earlier. Later they were dressed in a simple mix of extra-virgin olive oil, salt and apple cider vinegar. Sitting down to a simple, quick dinner of Creamed Spinach Soup, Greens Salad with Apples and White Cheddar and a hearty slice of flame-warmed pita bread was a great end to the drama that plagued my kitchen only about a half an hour earlier. Copyright © 2009 My Halal Kitchen. All rights reserved. The information contained in this blog may not be published, broadcast, rewritten or redistributed without the prior written authority of My Halal Kitchen. Every weekend morning I have the same dilemma- make a quick and usual breakfast, or make it an occasion by serving special foods that are timely to prepare but sure to please. The need-to-please disease I have tells me that small breakfasts should induce guilt. But what if I could serve a sizeable breakfast without all the struggle and extra time in the morning? I didn’t want to just put any old leftovers together- that would be a bit too obvious…. Luckily my husband isn’t a picky guy and doesn’t snub food the same way I would if I didn’t like it, which actually made me want to do a nice thing- not take up too much time in the kitchen (which throws off our entire schedule entirely), without skimping on the food, either. I decided to serve up eggs baked in ramekins, a savory pastry filled with spinach and feta cheese, a mixed salad, and sliced grapefruit. Not too fancy, but just enough to please, I hoped. I prepared the baked eggs or ‘Oeufs en Cocotte‘, according to the base of a recipe I saw on a Julia Child French Chef episode. I changed some things to make each dish of two eggs baked in a ramekin then set in hot water to our own liking: Mine was mixed with leftover homemade buttermilk dressing and on my husband’s I poured a simple, plain leftover tomato sauce (see details below). After about fifteen minutes of baking in the oven, they were done. In the meantime, I was able to set the table and prepare the next dishes. The savory pastry is a favorite in our home, mainly because the smell of baked phyllo puts me in a wonderful mood. Based on a combination of a recipe for Turkish borek from my dearest friend, Inci, and a Greek recipe for spanakopita handed down loosely to me from my cousin’s Yaya (grandmother), I have finally found a recipe that works for us. This one was prepared yesterday, but we really couldn’t finish it last night. It was too hot to eat and this is one dish where patience allows you to enjoy it more. The cheese has time to set and the dough is not as flimsy when it’s cooled. Today three pieces were reheated in the microwave for about two minutes and resulted in a perfect, warm taste. The cheese was set and the spinach had time to mingle with it, just enough time to complement each other nicely (recipe below). The salad was super easy. In my conscious effort to eat up the largest carton of mixed organic greens possibly for sale at Costco, I decided now was a perfect time to eat it up- and give my husband an excuse to eat something green. Just throw the greens in a large bowl, top with sliced tomatoes and drizzle the mix with olive oil, a pinch of salt and dried parsley flakes. Voila! It’s done. The last addition was the plate of peeled and sliced grapefruit, a great way to end the meal and clean the palate after all the dairy at the table. The important thing to remember about grapefruit is that if it’s peeled properly, you won’t taste any bitterness; instead it will taste sweet and refreshing. It’s a bit of work, but don’t have it any other way. Brunch was prepared and served today within a half an hour. It was delicious, healthy and very pleasing to both of us. There were no excuses left for today’s schedule to go awry. Uh oh, what have I started? Mix buttermilk, egg, oil, parsley, celery leaves, garlic, scallions, and herbs in a blender or food processor until smooth. Add salt and pepper to taste. Makes 6 to 8 servings of dressed salad. Heron, Katrina, Ed. with a foreword by Alice Waters. Slow Food Nation’s Come to the Table: The Slow Food Way of Living. New York: Rodale Books, 2008. Eggs Baked in Ramekins (Oeufs en Cocotte) can be found in Mastering the Art of French Cooking: Fortieth Anniversary Edition, Volume One, pages 123-124. It was written by Julia Child, Louisette Bertholle and Simone Beck. New York, Alfred A. Knopf. 2001. Buy one package of phyllo dough typically used to prepare baklava. When the dough is cold, but not frozen, open it up to its full length. Lay the dough down so that it looks rectangular. With kitchen shears or scissors, cut the dough in half vertically. Reserve half in the fridge to keep cold and keep the other half out to prepare on your counter. Using a pastry brush, ‘paint’ the bottom of your pyrex dish with a mixture of ½ cup olive oil and ½ cup milk (this should be in a cup next to you as you work). Lay a sheet of phyllo dough on top of it, then continue to paint each sheet one by one until you have finished this half of the dough. Mix the feta cheese, eggs and frozen spinach in a bowl until well mixed. Pour on top of the phyllo dough you have painted in the pyrex dish. Pat the mixture down so it lies flat. Bring out the cold dough from your fridge and continue to pain each layer individually until you are finished. Paint the very last layer generously and then add either sesame seeds or black seeds, but not both. Bake in a 375 degrees oven for approximately 35-45 minutes, depending on your oven. Allow to cool before eating. To roast a duckling is an endeavor not meant for the faint-hearted of the kitchen. I’ve cooked duck in the past and it was disastrous- tough, pan-seared breast that I never researched how to make in the first place. How hard could it be, really? It was the early years of marriage and my sweet husband ate every tough-to-chew last bit of it, while I looked at my plate deciding not to finish the ‘mistake’ on my plate. I knew then he was much too nice- or much too hungry. He argues that a person can be both, and that I must agree with. Well, that was seven years ago and I have since broken down and learned that it doesn’t mean I’m not a natural in the kitchen if I have to read a recipe or study particular cooking techniques, especially in preparation for roasting poultry and game that are not regulars at our dinner table. While recently shopping at our favorite Mediterranean grocery store, I scanned the frozen food aisle just to see if anything was new in prepared foods such as pizzas and falafel and meats like halal burgers and sejouk, or spicy sausages. I’m not a fan of frozen foods, but once in a while I do find something useful, especially at this store, which sells only halal products- very exciting in its own right. Much to my surprise, sitting right next to the halal turkeys, I spotted a smaller frozen bird of some sort. I thought it was probably just another whole chicken but it seemed a tad bit larger so I turned it around to look at the label, not expecting it to be anything I would actually purchase (we already had an entire lamb being prepared for us as we shopped). Sure enough, it was the first frozen halal duckling I had ever seen before. I plopped it into the cart and hoped for the best, hoping I wasn’t kidding myself into thinking I could actually make up for the last bird. At the checkout, the store clerk commented that the roast duckling would be ‘an extravagant meal’. “Great,” I thought. Just what I needed- not only to mess up the duck, but to waste money and ‘extravagant’ food in the process. “I’m in trouble now,” I murmured to myself. Once again, Julia Child came to my rescue, renewing my hope in ever being able to successfully bring a duck to an edible level. My husband’s only preference this time around was not to make the orange sauce that traditionally accompanies this bird dish. “No problem, I’m sure Julia has a recipe for that,” I thought. Life has a way of allowing you to surprise yourself once in a while. It just so happens that my newfound love of all things Julia Child ever created has brought me to remember the poultry pages of Mastering the Art of French Cooking, Fortieth Anniversary Edition. Simply put, “Caneton Roti”, or Roast Duckling, had real instructions I could follow on two pages (274-275), and I had all the ingredients in tow. I followed the recipe exact, like an apprentice following a master chef in hopes of earning a Le Cordon Bleu diploma at the final exam. If I messed this one up, I would be traumatized. That’s why I chose the easiest of all the duck recipes, and the only one listed for roast duckling, not duck- aren’t they older, anyway? I trussed it, cut off the wing tips and stuffed its cavity with fragrant herbs, just as instructed. I poured cut onions and carrots at the bottom of the roasting pan and laid him down gently out of the way of the vegetables. No water or broth needed for this baby- it would generate more fat than I could ever imagine. No need for basting, just keep removing the fat. After a few hours (much longer than the recipe suggested, due to the funny temperament of my oven), it was finally done- successfully. Served with a side of garlicky mashed potatoes, it was worth the wait–and the work–and the need to follow a recipe, at least once in a while. To find your own halal duckling, check out Midamar’s website at: http://www.midamarhalal.com/scripts/products.asp?C=Halal+Chicken. Each duckling costs $15.00. If you live in the Chicagoland area and want to take a drive out to the western suburbs to buy your halal meats, including a frozen Midamar duckling, check out our favorite spot: Mediterranean Oasis Mart Inc., 357 E Bailey Rd., Naperville, IL 60565; Telephone: (630) 420-9507. Ask for Abu Shoosha- he’ll take great care of you. This winter, I’ve snuggled up to more than my fair share of Julia Child cookbooks and DVDs of her cooking shows, “The French Chef”. So far I’ve seen countless hours of her slapping dough around to make croissants and French bread, demonstrating brutally tedious sauce-making techniques and offering 1960’s style video of her own shopping tours around Paris and the south of France. Nevertheless, I’m addicted to learning from this woman. As a result, for the first time I’ve made homemade French Onion Soup, following Julia’s recipe verbatim. It turned out perfectly. Even my husband was “warmed” up to the idea of eating enormous amounts of onions and butter and cheese in this hearty dish. He even warmed up to the idea of learning a little something from Julia. I think he’s enjoying himself, ever so slightly, because Julia was a practical woman and a wildly demonstrative teacher who made it easy for us to understand and learn from- something all teachers should be, in my opinion. Substitute ½ cup red grape juice for the sherry and remember to use only your own homemade chicken and veal stock, made from dhabiha halal animals. If you don’t have that, use a halal canned or carton broth (let me know if you see that in any stores), or a can or carton of kosher stock or broth. You can also use beef stock instead of chicken or veal stock but the taste will be a bit more “meaty”. And you can also just use one type of stock (i.e. only chicken as opposed to the combination), just make sure the stock is dark. Don’t make this dish if you will only be able to use water- it just isn’t worth sacrifice in taste. There were actually two classes taking place in the Hotel Indigo that day (Thursday, November 13)- one in the early afternoon called “Sweet & Savory Yeast Breads”, the one I attended; and another in the evening called “Festive Cookies & Pies”. I was fortunate to see the ad Wednesday night, sufficient time to plan my day around this opportunity. I arrived at the Hotel Indigo early enough to get a good seat near the front where I could clearly see and hear our baking instructor. I didn’t want to miss a thing- sort of a deja vous of my college days attending lectures by famed authors or politicians. I was kindly greeted by a friendly, slender young woman in a black fleece vest who handed me a booklet entitled “Baking with King Arthur Flour”. At my seat, I perused the book for a few minutes, skimming through the various bread recipes. There were tips and hints on baking and on the last page a valuable coupon towards the purchase of any variety of King Arthur Flour. I made a mental note to hit my local Shop ‘N Save on my way home, knowing full well they carried this brand of flour—and it was on sale this week. Before the class started, an employee, baker and editor of King Arthur’s bimonthly baking newsletter, The Baking Sheet, Susan Reid, warmed up the crowd by testing our knowledge of baking and even telling a personal story about how she joined the 100% employee-owner company of King Arthur Flour, located in Norwich, VT. She also explained the interesting history behind this company, which dates back to Boston in 1790. If your yeast doesn’t proof properly, it could be due to one of the following reasons: the yeast was improperly stored; maybe there was soap left in the container you used to proof; there could be too many chemicals in your water; perhaps the water used was too hard or too soft. It’s very important to measure ingredients properly when baking. If you bake a lot it might be a good idea to get a kitchen scale, for accuracy. Don’t sift flour unless your recipe calls for it. Cake yeast has a very short shelf life. When the dough was finished but not yet baked, she explained some creative ways it could be used. One idea was to make an almond-filled braid out of the dough; another to make a batch of cinnamon swirls. Both ideas sounded delicious. Ms. Hack made these seem so easy to make, I thought even I (the lazy baker) would be willing to give a try to the braided dough recipe. At the end of the program, the company gave out door prizes to many lucky winners- dough whisks, aprons, and gift cards among them. Although I wasn’t too disappointed that I didn’t win any of these, my heart broke when I didn’t win the only King Arthur Flour Whole Grain Baking book given away. And then, just as if the employee-owners read my mind, they wouldn’t let us leave empty-handed. Everyone- yes, everyone- was given a $10 King Arthur Flour gift card, a ¼ oz. package of Red Star Active Dry Yeast and a King Arthur Flour labeled dough scraper. We even got free samples of whole grain bread on our way out. A free program, door prizes and even more gifts upon leaving, made possible by the generous sponsorship of the Red Star Yeast company. I must say, not only was I impressed but it made me want to give my business to Red Star Yeast and of course to this quality company, King Arthur Flour, made up of nice people who love to bake, love to educate and are generous with their knowledge and time. Needless to say, I immediately used my gift card to purchase a King Arthur dough whisk, a tool Ms. Hack taught me was an important baking tool and one that would probably last me a lifetime. If you read your Sunday coupons carefully, you might have found the ad for a free recipe book on the Sun-Maid Raisins or Dried-Fruit Packages coupon ($1.00 off two). If not, the information below will show you the variety of recipe books they offer. One per household only. Enjoy! And please, share with us if you make any of the recipes from your free booklet. Include your name, phone number, address, city, state and zip code. A selection of recipes are available on this site. In a rush to get out the door in the morning, it’s often difficult to make something portable, easy to handle and tasty, all in one. I came up with this very simple and quick breakfast sandwich and would like to share it with you busy (or not so busy) folks out there. Toast your bread, or warm to preference. Then, spread the softened butter on each slice of bread, followed by the creme fraiche and then finally the jam or preserves you’ve chosen. It’s that simple! Trader Joe’s Fair Trade Organic Bolivian Blend Medium Dark Roast, Sweet Caramel Flavor, Medium Body Coffee. It comes whole bean in a 14 oz. container. organic raw cane sugar, to taste. Grind the coffee in a coffee grinder. If you have whole cinnamon, just put about 1/2 cinnamon stick in the coffee grinder at the same time so the flavors mix well. The amount of ground coffee that you put in your coffee maker depends upon the size of your coffee maker and the amount of coffee you would like to prepare. While my coffee is heating up, I put my milk in the microwave (1/3 of the coffee cup I’m going to drink out of). When both the coffee and milk are done, I add about 2 tsps. of sugar and enjoy it with my breakfast, nice and warm. And, as always, please let me know how you’ve enjoyed this post. In response to the message posted from Jen at Cabot (in my original post about Cabot’s Cheddar), I just wanted to make a special post for those who don’t read the comments. What a great resource for those who don’t live close to a source that sells the Halal-Certified Cabot Cheddar Cheese! Thanks, Jen! Shopping at Costco is both exciting and overwhelming. I always worry that I’ll miss something and equally worry that I’ll buy something in my excitement for the variety and quantity that is not actually halal. With regards to one product, my worry was replaced with delight when I was studying the cheese aisle. Which flavor should I choose for the meals I plan to create this week? Should I experiment with European varieties or stick to the American varieties I already know? Should I buy slices, blocks or cubes? I stumbled upon a Vermont brand I’m familiar with from shopping at Trader Joe’s- it was the Cabot brand of Vermont. When I turned it over to search for the ingredients, I discovered a Halal certification symbol right next to the Kosher certification symbol. I had to blink to make sure I wasn’t just seeing what I wanted to see. Sure enough, it was real, but on only this type of cheese made by Cabot, not the other varieties at this particular Costco (Mt. Prospect, IL). Sharp Classic Vermont Cheddar Cheese made by Cabot of Vermont. Net wt. 2 LB. Ingredients: Milk, Cheese Cultures, Salt, Enzymes. Manufactured by Cabot Creamery, Cabot, VT 05647. http://www.cabotcheese.com/ They even have a Cabot blog! http://www.cabotblog.com/products/. It appears you cannot buy their products online, but the website does have a store locator and a host of recipes and other information about cheese that is quite thoghtful of its consumers. No wonder, it’s dairy-farmer owned, since 1919. If you’ve enjoyed this post, please let me know! I owe my husband the credit of pursuing the creation of this totally dhabiha (meat slaughtered in the Islamically correct way) halal chicken tamale. We met a Mexican woman, Mari, from the southern part of Mexico City who now lives in Chicago’s Little Villag (La Villita). On a recent visit to Abuelita’s house, Mari offered us tamales made with Mennonite cheese and soft jalapeno peppers. 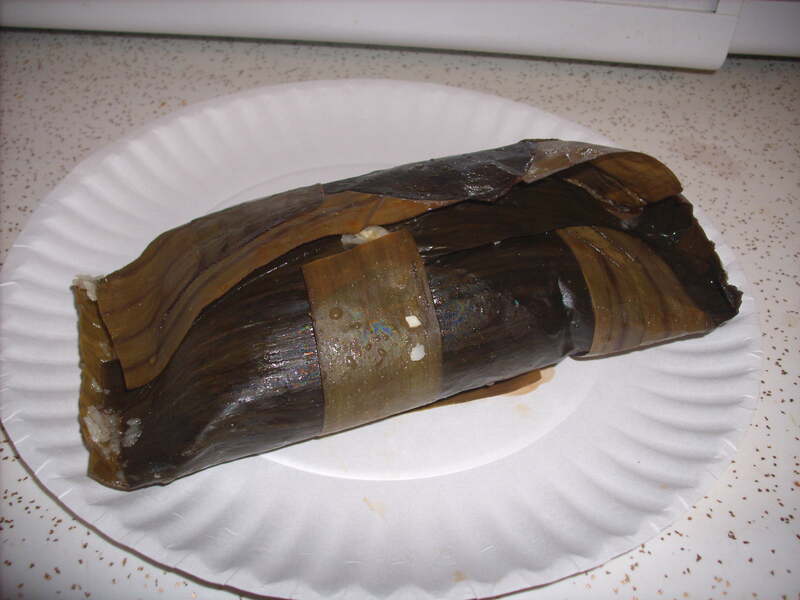 The tamale was wrapped in banana leaves and when opened, brought me back to the memory of my own Abuelita’s Puerto Rican pasteles, similar to tamales wrapped in banana leaves. Tamales are a traditoinal Latin American food whose main content is masa (steamed corn dough). They are then filled with meat, cheese and/or chiles. There are hundreds of different ways tamales can be made and home cooks have their own twist on traditional recipes. 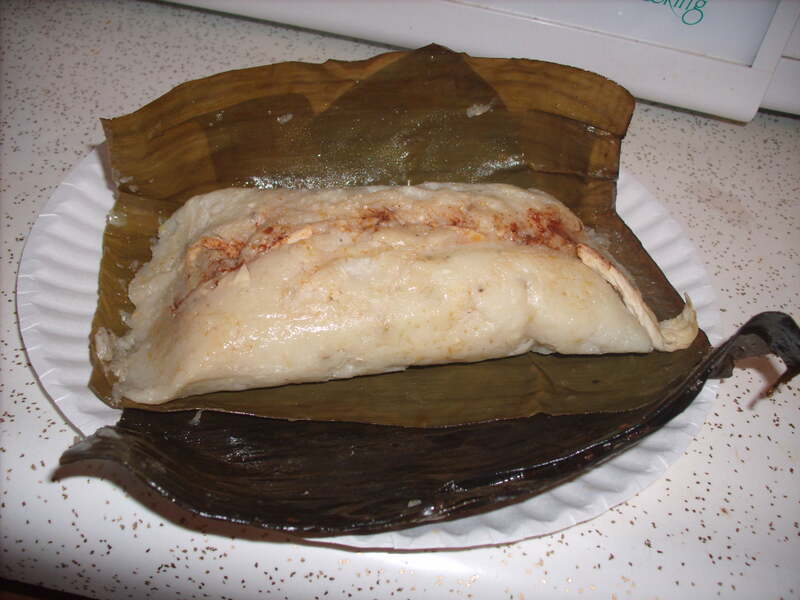 Although in Mexico most tamales are wrapped in corn husks, many other parts of Latin America wrap their tamales in plantain (banana) leaves. I was told that since Mari’s tamales are wrapped in banana leaves that they are of the Veracruz (Mexico) style. Mexican tamales are made with masa that is mixed with manteca (lard)- a very important word every Muslim should know if he/she wants to eat Latin American food because lard is pork fat. Although there is a health trend in Latin American cooking moving away from manteca to aceite vegetal (vegetable oil) or aceite de olive (olive oil), it’s better to ask whether or not your frijoles (beans) or huevos (eggs) are fried in them. Even Mexican, Cuban and Puerto Rican sweet breads (pan dulce) and regular pan is often made with manteca, which gives the pan its flaky crust. Be sure to ask. In the case of traditional Mexican tamales, the masa is almost always mixed with manteca for sabor (flavor). So, how did we avoid the lard and get dhabiha halal chicken into our tamales? A little questioning and prodding into the preparation of tamales was essential. Getting to know Mari was the next most important thing. Additionally, we’re fortunate in that Chicago’s Little Village neighborhood, although almost all Mexican, has one dhabiha halal chicken store called Pollo Vivo (Live Chicken). That is where we bought our chicken for Mari to make our tamales. We explained to her that we could not have the tamales prepared in masa with manteca, so we bought corn oil and she agreed to make it with that instead. Mari said it wasn’t such a strange request because when she lived in Mexico city she worked with many Jewish people and they also had similar requests for kosher meats and food prepared without any pork or pork products. The result was simply wonderful- and we weren’t the only ones to think so. Mari thought the result was less heavy and more healthy than the traditional ones prepared with manteca. Now, all I have to do is learn the process from Mari- then I can share the results with you! The owners are Muslims who keep chickens, rabbits and ducks in the store for a number of days and give them only halal animal feed. They are not kept cramped up in cages, but often seen having time to waddle around in their specified area. They are then prepared for you in the Islamic manner right there in the store within minutes of your purchase. The store also sells quail eggs when available and dhabiha halal turkey around Thanksgiving season. is located at 2601 S. Ridgeway at the corner of 26th Street and Ridgeway in Chicago’s Little Village(773) 542-9451. *Disclaimer: The opinions expressed here are entirely based on the author's own personal tastes, which may obviously be different from others who try the same product(s). The reviewer aslo declares that she has not received any monetary or non-monetary compensation from a restaurant or food product company for writing any review.